Good causes across Europe benefit when you play EuroMillions. The individual lotteries in each of the participating nations donate portions of the money taken in ticket sales to charitable projects. This page shows how much of the money you spend on EuroMillions entries helps those in need in your country, so you can be sure that you are not only giving yourself a chance of changing your life with a big lottery win, you are also supporting worthy projects at the same time. In the UK, 28p from every £1 spent on National Lottery games, including EuroMillions, is set aside for good causes. More than £37 billion has been raised since the National Lottery began, with over £30 million per week being added to the Good Causes Fund. More than half a million awards have been granted to projects across the UK, and the figure keeps rising sharply each year. 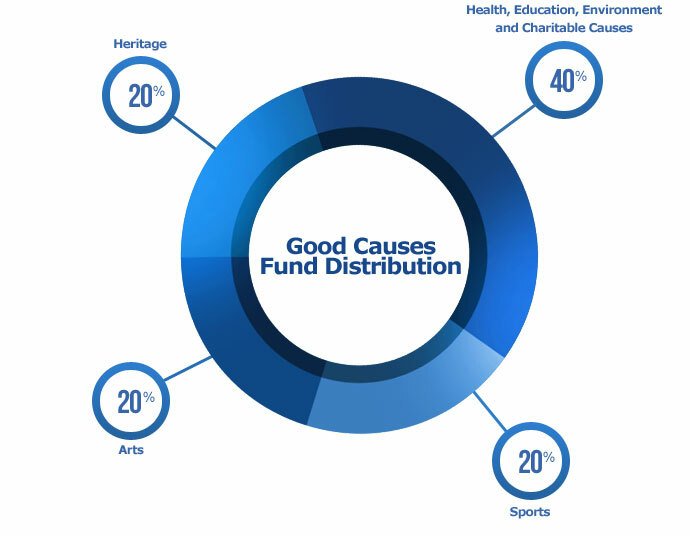 The funds collected are distributed by a number of bodies, covering four main categories – Sports, Arts, Heritage, and Health Education, Environment and Charitable Causes. Österreichische Lotterien, which runs EuroMillions in Austria, has been sponsoring good causes under the motto of ‘good for Austria’ since 1986. Austria’s Olympic and Paralympic Committees have been backed by funds raised through lottery games in Austria. A range of other humanitarian and research projects have also benefited, while money has been raised to help the protection of pandas, lynx and bearded vultures. The Belgian National Lottery is committed to helping various good causes and offers grants and sponsorships to a host of projects. A total of €185.3 million was made available for public service grants in 2016, split between 61.95% for humanitarian and social work, 27.44% for donations to the community, 6.5% for culture, 2.92% for sport and 1.19% for science. Française des Jeux, the French National Lottery, is committed to developing athletes with sponsorship programmes, providing social support through sport and helping disabled people access sports. It achieves these aims through funds from games like EuroMillions, which are distributed by the lottery’s foundation. The company also sponsors the Française des Jeux professional cycling team, which was founded in 1997. More than €5 billion has been raised for good causes since the Irish National Lottery began in 1987, and approximately 30% of the funds generated from games such as EuroMillions are donated to worthy projects. The money is distributed across the country, supporting local initiatives and larger organisations such as the CROCUS Centre for people with cancer, the Dyslexia Association and the Asthma Society. The net profit on all Luxembourg lottery games, including EuroMillions, is donated to good causes in the fields of health, sport, culture, social issues and the environment. The Nationale Grande-Duchesse Charlotte is responsible for distributing the grants on behalf of the lottery and has awarded almost €220 million to date, with beneficiaries including the Luxembourg Red Cross, the National Cultural Fund. The Portuguese Department of Games runs lotteries such as EuroMillions and donates the majority of net income to government departments who distribute the funds in the areas of health, sport, culture and social issues. Of the money provided for beneficiaries across Portugal and its islands, 28% is pledged to Santa Casa Misericordia de Lisboa, a charity dating from the 15th century which runs hospitals and other health centres, as well as supporting a wide range of other projects. Loterias y Apuestas del Estado allocates its profits to an array of good causes devoted to social issues, sport, culture, education and the environment. Some of the charitable organisations to benefit from funds from EuroMillions and other lottery games are the Spanish Association Against Cancer, the Olympic Sports Association and San Ildefonso Primary School. There are two official lottery operators in Switzerland - Swisslos and Loterie Romande. Swisslos supports national sports programmes such as the Olympic team and youth development in football, whilst also focusing on the German-speaking cantons of Switzerland and Ticino across sectors such as culture, sport, social issues and the environment. Loterie Romande provides support for good causes in the French-speaking cantons, benefiting the areas of sport, social action, education, health, culture, research, heritage, the environment and tourism.